The 500 hour Yoga Teacher Training program is a positive approach that helps to develop the right skills and expertise for a lifetime teaching experience. It is an advanced learning course that offers the precise amount of skills and insights to the yoga learners so that they can incorporate it into their teaching. The 500 hour yoga teacher training program in Dharamsala is an organized, well structured yoga course that will provide you with the entire yoga information and help you learn different yoga asanas from a basic level to the advanced level. This yoga training course incorporates classes that include many yoga asanas, meditation and pranayama along with yoga philosophy and anatomy. At the end of this course, you will be provided with a certificate that will make you an effective and skilled yoga teacher who can teach yoga or start a yoga class anywhere across the globe. The 500 hour yoga teacher training program emphasizes more on Vinyasa Yoga practice and sequencing, and expert level postures. The philosophy segment is covered after the knowledge of Chakras and the Kundalini meditation is imparted to the learners along with the discourses of Bhagavad Gita. The learners are also told about the fundamentals of Ayurveda. The major areas where the students will be expected to concentrate are pranayama, Kundalini meditation and chakra awakening techniques and Yoga Nidra. Therefore, under the 500 hour yoga teacher training program, we at Hatha Yoga School aim to educate the learners about the traditional and Vinyasa yoga and cover all the aspects of traditional yoga forms. The 500 hour Advanced yoga teacher training in Dharamsala is aimed at uplifting the passion of the students for obtaining the knowledge of authentic conventional yoga in an improved manner. The most fundamental style of yoga of the 500 hour yoga teacher training in Dharamsala course is the Ashtanga Vinyasa Yoga. The course will also include varied range of styles of Yoga that includes Restorative, Yin, Hatha, etc. This includes the subject’s anatomy, physiology and philosophy. In this course of Yoga Teacher Training in Dharamsala students will be provided with extensively designed course that will assist in nurturing the passion for learning authentic conventional yoga. The yoga course that is suitable for the participants in yoga targets at guiding the students in various levels of yoga that is associated with deepening of their approach and insights to the yogic living.Topics like meditation, yogic cleansing, breathing techniques, yoga anatomy, Mantra chanting, physiology and yoga anatomy are practiced in this course which provides in-depth knowledge about the overall aspect s of yoga. The 500 hour yoga teacher training course offers the best balance of the philosophical and physical aspects of yoga. In order to participate in the yoga training, we require students to have a minimum of 3 months of practice of yoga.The initial part of the yoga training will include the participation of the students in either 200 hours Multi teacher yoga training in Dharamsala or 200 hour Ashtanaga Yoga Teacher Training in Dharamsala. This 200 hour course will be followed with the 300 hour yoga teacher training course.On the successful completion of the courses, the students will receive 500 hours certificate of yoga training. In this 500 hour yoga ttc in dharamsala, students will get the opportunity to gain knowledge through theoretical and practical session of Ashtanga Yoga at the preliminary level along with the intermediate series with right alignment. The students will be facilitated for the development of in-depth comprehension of the prime alignment aspects, techniques of adjustments on various bodies and the manner in which Iyengar Props can be used. This course will be assisting the students to have daily practice of Kriyas, meditation and pranayam. They will be able to learn the Sanskrit names of the yoga asanas along with the losing and opening mantras. With the elaborate assessment of the yoga sutras, there will be obtainment of deeper understanding of the practices and philosophy of yoga. The course is designed for obtaining improved knowledge of the Physiology and Anatomy that are related to practice of yoga in order to become an efficient yoga trainer. The course includes comprehensive and systematic teaching methodology sessions which facilitate the understanding of Ashtanga Vinaysa Yoga and the variations that are included in this intense yoga style. 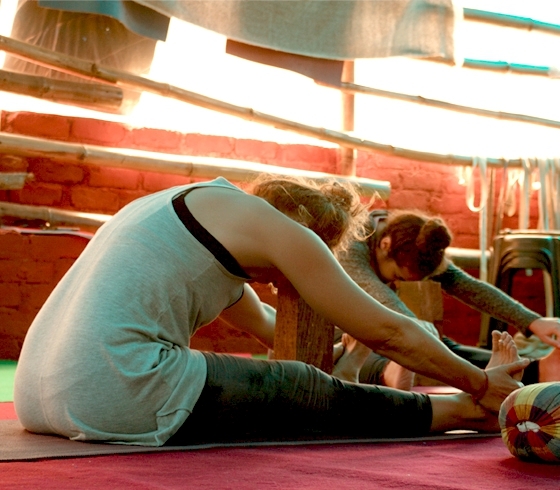 The participants will be able to structure a creative and well-structured yoga classes separately for themselves. There will be conduction of optional classes on Bodywork, online marketing of yoga and Ayurveda. Our 500 hour yoga course is one of the best 500 hour yoga ttc in dharamsala and the students will obtain the certification of having completed the intensive and extensive yoga course program for advanced yogis. The daily schedule of yoga classes in Dharamsala is mentioned below: students need to wake up by 6 am and have their Ayurvedic tea by 6:15 am. Their classes start by 7 in the morning which consists of pranayam, practice of asana and kriyas. The teachers as well as the students will be having their breakfast from 9 am to 10 am. The classes for yoga philosophy will be conducted from 10 am to 11:30 am. There will be training session for the art of methodology teaching and the alignments in the yoga asanas from 11:30 am to 13:00 hrs. Student will be provided with lunch in between 13:00 hours to 15:00 hours. Further, the classes for physiology and anatomy will be conducted 15:00 hours to 16:00 hours. This will be followed by the classes for Therapeutic Vinyasa or Hatha from 16.00 hours to 17:30 hours. The students will have a break in their schedule from 17:30 hours to 18:00 hours. The break time will be followed by meditation class from 18:00 hours to 19:30 hours. Dinner will be served to the students from 19:30 hours 21:00 hours. 22:00 pmEarly bedtime after successful day of 500 hours YTT course. 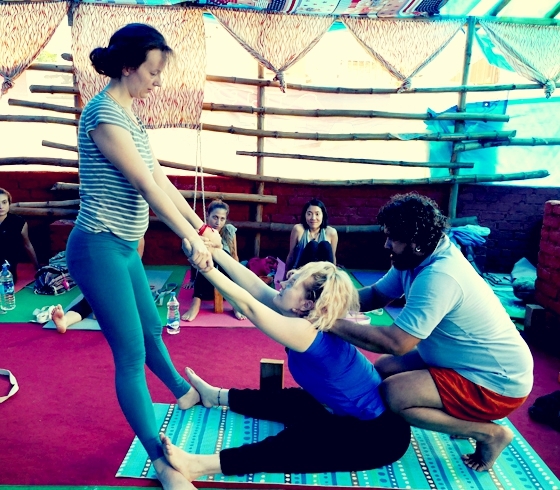 This syllabus of for the 500 hour Residential yoga teacher training in Dharamsala includes the session for teaching methodology which would include the techniques of hand on adjustments along with the correct use of props. There will be demonstration of yoga asanas that would include the arm balances, asanas that are hip opener, restorative yoga and yoga asana for specific section of people. There is inclusion of kirtans, satsang and mantra chanting theta re included in the course. This will impart the students with the holistic approach towards yoga practice. The course further includes the practice of Hatha Yoga, Ashtanga Vinayasa yoga, and Pranayama at beginner, intermediate and advanced levels. The course includes the in-depth study of the human body anatomy, and physiology. There will be key focus on the, musculature system which includes ligaments, bones, joints and origins of muscles. The palliation of yoga practices to the body and the implications that the asanas of yoga will have is studied in the course. The pranayama anatomy is studies with key emphasis on the chakras, energy systems, cardiovascular systems and energy body. The course includes the various path of yoga along with the meditation techniques. The yoga sutras are studied which included the sadhana, Samadhi, kaivalya and Vibhuti.Further, the students are also taught about the marketing tips regrading promotion of themselves as a yoga teacher in future along with their yoga studio.They will be demonstrated with the business skills and the way they can use the Internet for promoting their business.